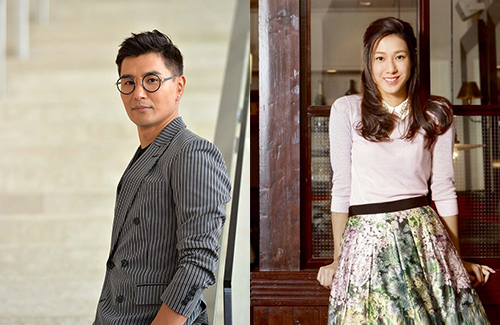 Ruco Chan (陳展鵬) and Linda Chung (鍾嘉欣) are netizens’ choice for TV King and Queen, according to the results from a poll conducted by Hong Kong media outlet Oriental Daily. The Facebook and mobile app poll, which went on for two weeks, asked netizens to choose their favorite artistes from this year’s best actor and actress nominees. According to Oriental Daily, a total of 27,840 votes were collected during the 12-day voting period. Each nominee also had a video profile introducing his or her work, and the total views for these videos totaled 184,207 views. Second place is Louis Cheung (張繼聰), who received 787 likes. Third place went to Anthony Wong (黃秋生), with 450 likes. While I hope that Ruco will win the TVB award, he faces tough competition from LOS. Yes, I prefer Linda over Nancy and Kristal.Nvr fancy Kristal drama all these years. And since BK Drama, I always felt that both Ruco and Linda can create that spark/chemistry that is “powerful” enough to capture audiences heart..:) Looking forward to another great collaboration from them. @rcel The competition is indeed tough but if he wins the victory will be much sweeter. Even if he doesn’t he already considers it an honour to be nominated with them. I like his spirit. @isay yes agree.All these while, he has been humble and that is a plus point. @isay hahaha you indeed made me laugh. A few thousand votes from a small sampling size(not even 1% of total population) you called that as tough? wahaha. @lam86 tats why i say that you’re stoopid. Im referring to the tvb awards that just a few days ago you yourself said is tough to win cos 50% is from public voting and 50% is judges” votes. Back peddling again? @isay you indeed silly. I comment on this news it means i were talking about this news la ignorant. Duh. Just a small sample size and you think RUCO is so popular in hk? Dream longer first la. His standard still not reaching tv king. Act few more years first until having an excellent and likable expression. @isay because you’re ignorant enough by not knowing that i was talking. Duh. @lam86 lmao who’s the ignorant one lol! I replied to original poster re her comment on the tvb awards and you replied to me didn’t you abt the polls? Irrelevant comment from you. Anyways rhe best way to end an argument with an i-diot is with one word “whatever”. So yeah “whatever ” to you. @isay lol, typical ignorant that lost in an argument that cant arguing with fact but ended up with insults and yelling. @lam86 You have comprehension problem? You don’t know that I was referring to the awards not the polls? sheesh…! who’s the dumb one? Readers here will know who’s talking sense or nonsense. I don’t see further need to explain. @bubblytea lol, I mean among the 3, if no other choice, I wld prefer Linda over the other 2. To me, I still think that Sheren Tang and Charmaine are the only 2 Lead actresses that are outstanding. Very few or none could be on the same par as them. @looooooooooo lol, title so misleading. Few thousands votes only like it represented the whole 7 million citizens. LOL Ruco can win my favourite, but for TV king work more harder first. hehe. @lam86 you really make me laugh. Since when do polls ever represent the whole population or claim that they do? Fact is they don’t cos that’s just impossible. Not for this poll and not for any poll. Polls only represent a sampling of the population get it? Muah ha ha ha! @lam86 haha pointless to argue with stoopid people. I already said that it doesn’t rep the whole population. You don’t know meaning of polls or sample? It’s understood that polls is only a small sampling. No need to be so specific duh. @lam86 hello? When do polls or surveys ever include the ENTIRE population as you’re suggesting? That’s logistically impossible. So wat polls do is to sample a group of people and draw reasonable conclusions from there. Anyways the old folks always say that you can never win an argument with a fool. So i shall stop here. @isay stop being a fool. Since when i said poll must include the entire population? Poll does not specify what volume. It does not mean it must be small or big. Not like what your ignorant claimed must be small. Duh. I just said the title is misleading because its just a small sample being used and just won the hearts of few thousand citizens. @lam86 words of wisdom 101: end an argument with an i-diot with one magic word “whatever”. Hey lam86, whatever! @isay Nope because you ignorant yelled that polls mean small sampling which is silly. Polls does not mean must be small size. It can be big or small. What i meant was the title is misleading because it only won the heart of a few thousand citizens and thats it. And i dont blame you for being a kiddo based on your explanation. Having more years of experience does not mean must be winning or else many experienced actor like francis,damian and etc should have won long time ago. Louis Koo was the youngest actor to get the awards and beaten many veterans actor during his time. If based on your logic louis koo should not had won. A person winning an award is based on many reasons. Not just acting skills alone. I did not say its shameful to lose to Anthony but a loser means a loser but its very fun to see a fan of ruco like you to even dream of standing a chance to win that awards. lol. You cant reply any further because you can only argue ignorantly without any proper evidence and can only insults and yelling. What i argued are based on facts,history,results and etc unlike your perception and idiocy. @isay right. impossible to have whole population. Unless there are 2 scenarios. :)TVB is the only Entertainment media in the world, and that the artistes involved have tonnes of pulling power. … Haha. @looooooooooo agree too! ruco only has his signature charming smile. tats it. acting? hmmm. in doubt. Linda anytime over grace chan and sisley. @janet72 lol, been in the industry for so long if cannot better than grace and sisley also weird la. But honestly linda acting not deserve to be TV queen la. But her singing got improved alot. Currently, seems like TVB is lacking fadans that can capture audiences heart. As for male lead, besides Ruco ( I’m a Ruco fan,lol) other worthwhile one I would say is Wayne. Very versatile actor , and some of his dramas are worth catching. what a joke if linda wins…her acting skills…. @m0m0 linda chung’s acting cant make it. i still cringe when i recall her role in Tiger Cubs. i don’t have access to watch the TVB awards…read on FB that 黄秋生 got the TVB King. that’s ridiculous! where in the world has he been all this while? @janet72 anthony? If yes congrats. Deserving winner on performance alone. I like Nancy and hope she’ll get more opportunities from now on, but Ghost of Relativity… I’m not sure what to say about it that hasn’t already been said. I would’ve also liked to see Matt and Rosina win the Most Improved awards instead, but oh well. @skinnymocha Rosina got married la. Why tvb want to promote her and she might stop filming in few years time. @skinnymocha worst awards is the tony & grace. worst choice ever. grace is jus a pretty face at least she has a pretty face. tony is hmmm. i hardly see his eyes open. wat did he do to even get the lead?